Falling wtihin the the medieval ecclesiastical parishes of Denbigh and Henllan, in the commote of Is Aled, in the ancient cantref of Rhufoniog. The borough charters of Denbigh granted by Henry de Lacy, earl of Lincoln in 1283 and 1290 indicate that burghers of the new borough were granted agricultural land in the the surrounding township in addition to a property within the town. The precise location of the land grants has not yet been established but some probably fell within this character area, being worked from farms based in the town of Denbigh, and may be the origin of the distinctive field pattern in this character area. 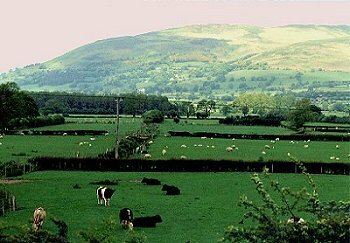 Pasture, gently sloping from a height of about 50m OD on the south-west, on the northern outskirts of Denbigh, down to about 30m OD on the north-east, on the margins of the floodplain of the Afon Clwyd. Dispersed farms, and a number of scattered smallholdings, generally more than about 1km apart and on the higher ground towards south and west, some now abandoned as farms. 18th/19th-century limestone or rendered farmhouses, as at Meusydd-brwyn, with 18th/19th-century stone and brick outbuildings, and stone-walled farm yards. Distinctive landscape of medium-sized rectangular and strip-shaped fields, between 50-150m wide, laid out in blocks in relation to system of major drainage dykes and ditches, some of which extend in a straight line from south-west to north-east for distances of almost 2km. Fields bounded by drainage ditches and generally low and well-maintained mature hedges, with scattered oaks in hedgerows, some hedges being replaced by post and wire fencing. Stone gateposts to field gates along public roads and along some of the farm lanes. Some areas of ridge and furrow towards the south-west, running parallel with the field boundaries. Scattered ponds of uncertain date and function within fields and along field boundaries, some of which have been levelled in recent years. Small sheds and barns of stone, brick and corrugated iron in the corners of some fields, some now ruinous. Access to the land is by means of farm lanes and tracks leading downhill from the west, forming hollow-ways on the steeper slopes. Land of parkland character around 19th-century brick St Brigid's Convent, walled along the main road on the western side of the character area.